Microsoft Surface is more than a computer. It’s a leap ahead in digital interaction. By enabling you to use your hands instead of a keyboard and mouse, it revolutionizes the way you interact with digital content, while keeping the ability to connect with other devices such as networks, printers, mobile devices, card readers, and more. Our Microsoft Surface Partners have created hundreds of applications for the platform. Microsoft Surface is currently based on the Windows Vista platform, which makes it especially easy for companies to manage, deploy and support Microsoft Surface units. The current version for the software platform is Microsoft Surface 1.0 Service Pack 1, which enhances Surface with an enhanced user interface, improved manageability to help reduce the cost of ownership, broader international support, and faster, easier ways to design innovative applications. Read more about Service Pack 1 on the Microsoft Surface Blog. The sophisticated camera system of Surface sees what is touching it and recognizes fingers, hands, paintbrushes, tagged objects and a myriad of other real-world items. 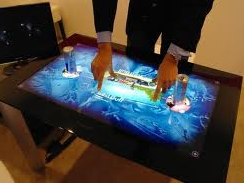 It allows you to grab digital information and interact with the content through touch and gesture. And unlike other touch-screens, Surface recognizes many points of contact simultaneously, 52 to be exact. This allows multiple people to use Surface at the same time, creating a more engaging and collaborative computing experience than what is available via traditional personal computers, mobile devices, or public kiosks.